mlakers wrote: Still restlessly pacing back and forth to the saltwater pool. And the crab is, too. Lol! I'm rooting for you buddy! Best of luck! If you need any tips with water chemistry and what not I may be able to help a bit. 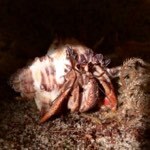 I've been keeping aquariums and breeding difficult fish for almost 10 years now and I've noticed that some advice and techniques are useful with hermit crabs as well. Who knows? I may have a trick or two up my sleeve if you ever need it!! Best of luck!!!! Thank you. Covered the tank about 7:30 and walked away because I was making myself nutso. Just checked and she is parked right beside the saltwater pool. Gah! Now she is alternating between hanging half out of her shell and chasing away any other crabs that come near. It HAS to be any minute now. I covered the tank again and turned off the red nighttime light. She seems to be more comfortable with that. **Please let me know if this image doesn't work for you. This is how my modified kreisel tank looks now. I have an adjustable, submersible heater on the back wall (placed at an angle) and a floating thermometer on the front wall reading ~78 degrees F. The heated "outer" water is fresh water that I don't have to change out but it helps moderate the temps and will keep any larvae from getting zapped by the heater--a problem others have had. Each of the smaller tanks contains saltwater made with Instant Ocean to the usual specs (1/2 cup to one gallon of Prime-treated freshwater). I have marked the line of the water so I can keep it consistent, adding freshwater as it evaporates and the water level drops. With bubblers and warmer temperatures, the evaporation rate of both is pretty significant. I have newly hatched brine shrimp in the left tank that I have not tried to feed yet. The shrimp in the right tank are a week old and clearly starting to die off. I tried feeding them phytoplankton a few days ago but it seems to be reducing their numbers further, likely from a nitrogen bump. Today I changed out 1/3 of the water in the right-hand tank using a turkey baster with pantyhose over the end. Worked really well. I could target the messier areas and no shrimp got sucked up into the wastewater. Confirmed that at least some of the shrimp survived the 1/3 water change. Also, I am trying very hard to do this A) On the cheap and B)Without unduly stressing myself. So far, I am succeeding on A, not so much on B. The smaller "tanks" are just cheap plastic goldfish bowls. I had to use rocks to weight them down or they would float. I also added sand and the tiny shells now, even though it's way early. I figured why not make them a part of the setup from the beginning? I know others have used strict laboratory-type setups, but I wanted to more closely mimic the wild conditions. It may make them harder to clean, but we'll see. For the bubblers, I had to use a splitter on the line coming out from the pump--and AFTER the splitter a control valve on EACH LINE in order to properly adjust the flow and regulate them. One flow valve didn't work for both, no matter how I tried to finagle the adjustments and length of air tubing, etc. It's a super easy fix but one that took me several days to figure out. (Doh!) And the splitter kit comes with three or four of each splitters and control valves for very little cost, so I had them on hand already. The miniature shells I found at Michael's craft store in their shell section. Before heading to Michael's, I made a trip to a saltwater fish store and the owner gave me a handful of his tiniest shells for marine hermits but they were still too large and heavy. These babies that will take shells (IF I ever get to that stage) will need the lightest, smallest snail shells available if they are going to be able to drag themselves up on land. I also bought brine shrimp eggs for hatching and put them in the tanks ahead of time to make sure: A)They would hatch--telling me conditions are at least not instantly fatal and B)Any baby hermits would have an available food source right away. I bought phytoplankton, too, but after using it with the brine shrimp, I have concerns with that. If I DO try it out with hermit larvae I will only try it in one of the two tanks and will keep a close eye on it. I am on the fence about buying a nitrogen measuring kit. I know it would be useful, but they aren't that cheap and it will also give me one more thing to stress over, which I am trying to avoid. But I reserve the right to buy one later at my local pet store if things progress and I want to know that detail. I also FINALLY have visual confirmation of eggs on Garbo (the last suspected gravid female). She is my shyest crab (hence the name) and has been my timid hider from day one. All of her behavior since the full moon in September has screamed EGGS to me, but she's a small shy crab in a big shell and I could never get confirmation no matter how I tried to catch her turning a certain way while blinding her with a high-powered flashlight. Nothing. She is still hanging out near the water, part way out of her shell, but she is holding onto the eggs but has moved them closer up to the shell opening. They are a nice gray color and there look to be plenty of them. Come on Garbo, you can DO it! She's doing something that I don't know how to interpret. She is either grooming the eggs or her shell, or working to separate them from her pleiopods...or she is eating them. I'm not sure what to do. Let nature play out, assuming there's a logic beyond human logic? Or intervene and potentially disrupt a natural process? There are still plenty of eggs, even if she IS eating some. Could it be like the mammal mother that eats the placenta? Maybe it's natures way of ensuring the mother replaces some lost nutrients. Or does the crab saliva somehow help them hatch? Gah! I wish I knew!! Keep in mind that this is a shy crab that HATES to be stared at...and I've been doing nothing but staring at her and shining a light on her for the past week. Could this be a stress response on her part? Anyone? Okay. The panicking is under control. I think she was getting stray eggs and moving them back up to the mass. Possibly using saliva to secure them all into one big blob. They are really pretty, nice and gray, with tiny black eyes. I swear, she is THE MOST elusive crab. Even staying close to the pool she hides herself demurely behind a leaf and keeps peeking out at me. She pulled a rock up next to her on the other side. Modest crabs. Bah. This is the best pic of the lot and it's not very good, but the gray area to the right (her left) is the mass. I feel like it will be tonight. I'm so badly wanting to see how this all plays out. So excited for you!